These are in between a cookie and a candy, they are heavenly. 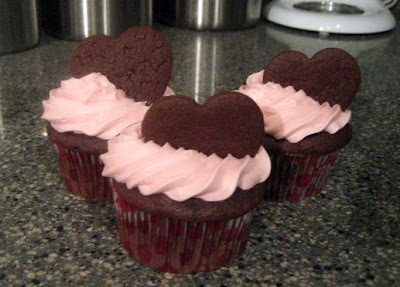 I made mini ones placed on top of pink frosted chocolate cupcakes for a Valentine's birthday at work last year and they were a huge hit. They are amazing without a cupcake too! 1. In a bowl, whisk together flour, cocoa, baking soda, and salt. In another bowl set over (not in) a saucepan of simmering water, place chocolate, butter, and brown sugar; stir frequently until almost completely melted. Remove from heat, and stir until completely melted; let cool slightly. 2. Add egg to chocolate mixture. With a mixer on low, beat until well blended. Gradually stir in flour mixture (dough will form a ball). 3. Divide dough in half; roll out each half on a sheet of parchment paper to a 1/4-inch thickness. Transfer each half (still on paper) to a baking sheet; freeze until firm, about 20 minutes. 4. Preheat oven to 350 degrees. Working with one half at a time, flip dough onto a work surface; peel off paper. 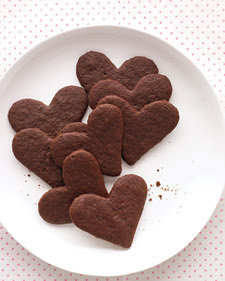 Using a 2-inch heart-shaped cookie cutter, cut out cookies; place, 1/2 inch apart, on two baking sheets. Bake until firm and fragrant, about 8 to 10 minutes. Transfer cookies to a rack to cool.